I don't know what you would do if you won the Powerball jackpot of $600 million this past week, but I have a plan in case I ever enjoyed such a windfall. I would move to Las Vegas and set myself up in a luxury suite. Then I would keep an eye out for penniless young newlyweds. After careful evaluation, I would approach the naive lovers and offer them a million dollars if they would agree to let me sleep with the bride for one night. Just to see how their relationship survives the ethical choice they are forced to make. Yes, that's what I'd probably do. Unless the newlyweds are Clevelanders, of course. Then I could probably get away with just offering them $120. Yes, I dream a lot about how I would conduct myself with loads of money. But how to get it? Certainly not by writing about movies, I learned that the hard way. Whilst authoring a couple of books about the Great Lakes, I did find a certain romantic appeal in the idea that, had circumstances of my life gone along a radically different course, I might have become a Great Lakes sailor. Has to be a more noble and honorable profession than writing up SAW sequels for the weekly rag, correct? And there would possibly be a decent paycheck in it as well. 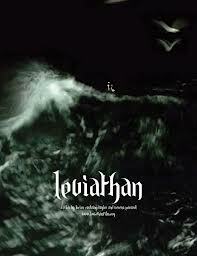 Well, here to scare me straight, belatedly, is LEVIATHAN. No, not the 1989 GMO sea-monster movie that tried to cash in on James Cameron’s THE ABYSS. This is a documentary, of sorts, that bids to be the total-immersion experience in life aboard a stormswept (at least it appears to be that way) New England fishing vessel. Allow me a slight digression: a decade ago or so there was a Great Lakes sailor, Ray Meyers, I believe his name was, who had a sideline of shooting VHS home movies during his voyage aboard the mighty haulers and freighters of the inland seas. This material he would copy and package and sell to the public, at dive shops and the like, for the edification of maritime-fanciers who wanted to experience vicariously the sense of life on board a working ship. The tapes were no-frills, narration-free scenes of massive steel vessels going in and out of ports and canal locks, the views of assorted bays, maybe a storm or two. I think he told me he actually had a lightning strike caught on video. It was for the specialty audience of boatspotters and ship fanciers. Now, imagine that guy with a fat arts grant and one heckuva tough, waterproof HD digital-video camera. You have LEVIATHAN, a non-narrative nonfiction from Lucian Castaing-Taylor and Verene Paravel, showing the regular routine aboard a New England fishing trawler. Since none of you have likely heard of poor old Ray Meyers, then picture LEVIATHAN instead as something like the stripped-down art-house version of TV's The Deadliest Catch. Hand-held, chaotic imagery, bordering at times on the abstract, plunges us into a tempestuous world of anchor chains, barely-glimpsed men in rain slickers shouting orders, as the ocean's harvest is dredged and netted from the deeps. Many times we literally don't know whether it's day or night or which end is topside, as the lens shows a flock of seagulls - ever accompanying the giant fishing trawler looking for handouts - reflected mirror-like in the water (or something) and practically indistinguishable from the fractal roilings of Atlantic sea foam. The nets dump numerous fish and marine organisms into a hold. Men stoically sort, gut and fillet the unfortunate creatures (maybe some of the rays get thrown back; others seem to be cut up on the spot for chum), leaving a mass of sea creatures, most dead and a few still living, sliding back and forth in the briny hold. One greedy gull also finds itself trapped in there; since the bird shows no fear of the camera, I must assume the rig was unattended or otherwise remote-controlled. The filmmakers did leave some cameras around like that, including tethered to floatation devices on the water. We do see the crew, in dialogue-free glimpses of big, beefy guys wordlessly carrying out the grubby prep work, showering or sitting idly in the galley. Someone I take to be the skipper is listening to blasting grindcore rock and roll on his radio; I would have hoped for Billy Joel, thanks to "Downeaster Alexa," but I guess not. One stereotyped is confirmed, though - even today, sailors have mermaids tattooed on their biceps. Sailors and people in jail really ought to be the only folks with tattoos - they've paid the dues. As transfixing as the DV imagery sometimes is, I have to say a little of this does tend to go a long way. And I could imagine that watching LEVIATHAN on a big screen, instead of a little preview DVD as I netted, could be a whole different experience. As in seasick. Just because you are a Harvard professor and go out to sea and get wet and bumped around does NOT make your footage worth seeing. A real tough editing is needed here, such as when I ran this dvd at quadruple fast forward, reducing it to just a few minutes. Even then, some scenes should be deleted. Were they really surprised that all flesh food on the plate comes at a high price? Do all these film reviewers and their academic buddies never think about food, until they find themselves on the deck of a trawler? Hey !--HEY! that is real life--and real DEATH, get it Prof??? Eat some vegetables if you are so guilty, but keep this stuff as a home movie; "What I Did on My Sabbatical..."
Sound was unhearable, in fact frustrating, more informative as silent on fast forward! And that essay by Cyril Neyrat? Not only must it have been poorly translated, it was written in garbage-academese...sincerely hope no one got tenure for that!